serve all your customers with a very easy and simple to use Jet Service Desk, with interfaces that are easily understandable, Jet Service Desk software will facilitate service to all customer of you, Jet Service Desk software can run on any operating system Windows 2K / XP / 2003 / Vista / Vista64 / 7 / 7 x64, only Jet Service Desk software requires MS SQL and SQL Server, for installation requirement, there are various features that will facilitate your support to all your customers like, Main module includes integrated system notifying the which informs the users about the following events, new requests for the current user registration, adding comments and files to the request of the current user by clients, the approach of start / reaction time of the request, and more. 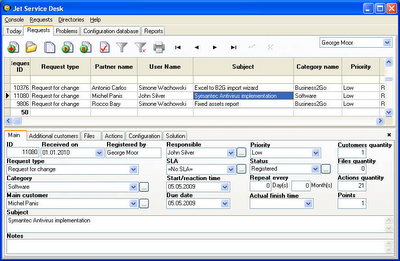 at the Jet Service Desk software also has a reporting system such as, Fast Report executes the SQL query included to the report, with parameters from the application, and prepares the report, Consequently, the users of the system may easily execute, create and modify the report forms, The reporting system is based on Fast Report 4 report builder. Jet Service Desk software is sold at a price of USD 99.00, but if you want to try it out first, you can download a trial version, by clicking the download link below.